From holiday music to twinkling lights, 'tis the season to make your spirits' bright! Even if you have a stockpile of holiday decorations from years past, it's always fun to deck the halls with something new. But why buy more, when you can make your own decor? Holiday crafts are a great activity for the family as you get together around the holidays. 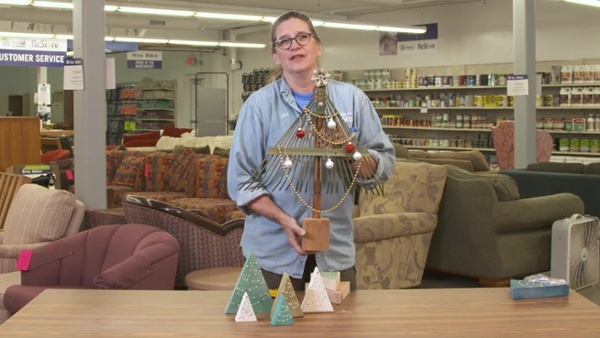 In this video, Jan Hagerman, with Twin Cities Habitat for Humanity Restore, will show you how to make three different decorative Christmas trees. Turn your empty shelf into a festive forest with these wood Christmas trees. For this first project, you can take 2x4 and 2x6 wood blocks and cut them down at the corner to get the triangular tree shape. Then, stain (or paint) the triangles the color of your choosing. If you want your trees to have a little more flare, dip a Q-tip® in paint and dab on some ornaments, add string lighting using yarn or paint, or maybe even glue a star on top. This is a great craft for the kids to enjoy and give as gifts (but leave the board cutting to the adults, of course). Next up, an elaborate DIY Christmas tree using a garden rake. In the video above, Jan used an old garden rake with a broken handle. She turned the handle around as the "tree trunk," added a star on top (using an old spicket), decorated the framework using some beads and ornaments, and mounted the rake on a wood stand. If you're looking for Christmas tree decor of a grander scale, this third project might be just the ticket. Have an old ironing board at home? Flip it so that the wide end of the ironing board is on the ground and the narrow portion is on top. Wah-Lah! You have the shape of a Christmas tree. All you have to do is paint it green and add whatever decor you want—ornaments, garland, you name it. The best thing about this last project is that it can be used as decor or as something more functional like a magnet board to hang Christmas cards.